David Meade's Planet X 2017 Arrival book claims overwhelming proof of well, you know, the end of the world in October 2017. Does it present anything new after so many failed doomsday dates? Yes, but dreams and visions from people you don't know or recognize may not be a "good new." Find out why this book's predictions will fail like all the rest before it (and why it's getting attention despite this). After requests from several readers, I am taking time to comment on yet another doomsday date theory: David Meade's Planet X 2017 Arrival book (2016). I share my rationale because every time I review another author's book, I do so at the risk of being accused of "knocking" other authors. I receive such accusations from people who do not understand how many emails I get from worried readers terrified by the doomsday speculation of my peers. They imagine malice on my part for criticizing the ideas (not the person) of another teacher and miss the distinction between the two. Often it's because they agree with the other author or have bought his book. If I am not in agreement, then I must have some hidden reason or motivation (or so they suspect). But my motive is to seek and speak truth, in love, not to put others down (Eph 4:15). If it offends some, that I cannot help. The last two are tabloids but even they don't usually cover a doomsday date put out in a book by a conspiracy theory author . In the book, David Meade claims "overwhelming evidence for the 2017 arrival of Planet X / Nibiru" as part of an eight-object "solar system:"
The evidence to support this is overwhelming. There are 40 volcanoes erupting at the same time on Earth now. Earthquakes have dramatically increased both in number and intensity. The Elite are frantically building underground “safety” bunkers. ... Storm systems are multiplying ... Sinkholes and cracks are appearing in the earth’s crust. Heatwaves are getting stronger and are lasting longer. I’m just waiting for the fat lady to sing! This system is ... coming to us from an oblique angle and toward our South Pole. This makes observations difficult, unless you’re flying at a high altitude over South America with an excellent camera. ... The public is being kept in the dark deliberately to avoid panic. Strange that scientists prefer ground-based telescopes when airplane-based cameras can give them even better observations, right? And as you will see below, there is no way anyone could "keep the public in the dark" when the public has the ability to see Nibiru with the naked eye if it existed.. It lacks hard scientific proof for Planet X. Instead has dozens of pages of religious evidence including dreams and visions. It presents little, if anything, you won't already find on the Internet. And that last point is really characteristic of this subject. Planet X/Nibiru is an internet hoax theory with no scientific evidence as NASA says. Yes, NASA may have found Planet 9  and they have found several dwarf planets since 2006. But what they keep finding is nothing big or close enough to threaten the earth. "observations difficult"? Professional astronomers can tell you that even a single object the same size as earth would be spotted years in advance by even amateur astronomer telescopes. Something many times bigger than earth (as Planet X is always claimed to be) is not arriving October without the internet exploding with amateur sightings of something so important because it would be visible with the naked eye already . As NASA scientist David Morrison said, "No one could hide Nibiru if it existed." If it was real, there would be photos. "earthquakes increasing"? Check the USGS  and British GS sites and you will find no confirmation of increased earthquakes in recent years—apart from manmade earthquakes like from fracking. They dispute claims that there is an uptick  apart from that. "Volcanoes" heightened? Again reputable sources contradict this claim,  including the "40 volcanoes erupting" one . Nothing escapes the Internet eye, so where is the panic over the clear increase in vulcanism? It's not real. "Multiplying Storms / Heatwaves"? I guess right here I could say we better call Al Gore and tell him someone hijacked his Manmade Global Warming evidence. Again, the evidence that weather has gotten worse in recent years is disputed. In the end, when you anyone resort to shaky, debatable evidence like the above, you ought to ask why? Because they do not have the proper strong indisputable evidence. In this case, astronomical sightings of the object, just like real scientists provide when they spot things as small as asteroids that may menace earth. Given the evidence and sound logic above, a reasonable person must rule out a large planet ever sneaking up on earth in accordance with the Planet X / Nibiru conspiracy theories. It would be spotted years in advance. To believe otherwise just requires ignoring too much established fact to accept. Obvious problems like this is why I have never believed in Planet X / Nibiru (although I used the name in the title of my book because so many people do believe in it). What I have always believed in is Wormwood in Bible prophecy (Rev 8:10-11). Wormwood is the name given to the object that people will blame for the global calamities that Revelation spends the better part of three chapters describing (Rev 6-8). To answer that you have to understand what Wormwood is and how it differs from Planet X theory. As we read above, Planet X is some huge object, on some huge orbit which may have brought it by 3600 years ago and may have other objects with it. All this makes it impossible to hide or not see evidence of in our solar system as David Morrison says. Wormwood has none of those dubious and problematic claims. Revelation does not say it came before or that it comes with anything. And what about the size? In your Bible you will read that it is a "star" which would be huge, even a dwarf star. But the Greek word that "star" is translated from (aster) is not specifically a star. It can mean any objects in space besides the Sun and Moon. It can be a star, planet, comet, asteroid, or meteor. It causes a unprecedented great global earthquake (Rev 6:12). The quake "moves every mountain and island out of place" (Rev 6:14). Shooting stars simultaneously completely fill and stream across the sky (Rev 6:13). People hopelessly duck for cover in the caves in the mountains (Rev 6:15). Rocks begin to fall and burn up all the grass and asteroids hit the ocean (Rev 8:6-9). Revelation records a new calendar of a 360 day year and 30 day month  immediately after. The only object that could explain all this is a dwarf planet. That's a planet below the size of Mars or less. We began discovering them around 2006 (which lead to the demotion of Pluto from planet to dwarf planet). Unlike with large Nibiru objects, scientists say there are still more dwarf planets out there, lurking. If were dark (non-reflective) enough and coming from the South Pole, perhaps it could escape notice until months before impact, creating the panic described in Revelation 6:15. A dwarf planet would still be big enough to cause a great earthquake as it passed earth. Yet small enough that earth's superior gravity would be able to rip it apart, causing it to (at least partially) disintegrate (Rev 8:10-11). This would result in many pieces, like shotgun blast of shooting stars (Rev 6:13), meteorites (Rev 8:7), and asteroids (Rev 8:8) raining down on the earth. They light up the sky as they fall from heaven to cause destruction below (Rev 8:10-11). At the same time, Wormwood is still literally "falling on the earth" "burning like a torch" yet not in one single deadly piece. This then explains how a star can fall on the earth and we survive. It burns up as it breaks up and enters the atmosphere. 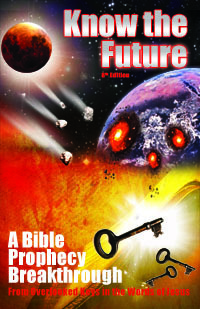 That's the real doomsday scenario coming not according to some conspiracy theorist on the internet but according to "a more sure word of prophecy" (2Pe 1:19) God delivered to us in the Book of Revelation. To understand all about what's coming, God's plan to help you survive it and what you don't have to do now to prepare, read my book Know the Future available here on the site.